There are several naming conventions for waterfalls used in Britain and Ireland, as a result of our rich history of languages. For today, I am going to confine myself to waterfall words, ignoring the various rapids, cascades, and weirs that are not quite waterfalls. In that I am going to let centuries of forebears lead the way and follow the names they have chosen. But even 'Falls' is just a common English word, and most English waterfalls are called 'Force', from the Viking word 'Foss'. This word is associated with the North of England, and the Lake district, which happen to be both where the waterfalls mostly are and most heavily associated with Danish settlers. You will also find the occasional 'Spout', or even 'Snout', which is probably a variant of the same name. Note that 'Snout', as describing a feature like an animal's nose, need not mean a Waterfall. It might mean a hill or ridge, as in C9444 : Grand Causeway and Aird Snout or NT1815 : Deacon Snout . This is a linguistic convergence, not a connection; rather like the two meanings of 'Fosse'. The Scots word 'Linn' occurs several times, and even creeps through border territory into Northumberland. As well it might. 'Linn' has two watery meanings; a waterfall or torrent; or the pool at the base of same. It is a convergence of the Scots Gaelic 'linne' (cognate with Irish 'linn', Welsh 'llyn' - a lake or pool) and Old English 'hlynn' meaning 'torrent' Perhaps the 'waterfall' meaning flowed North, not South. 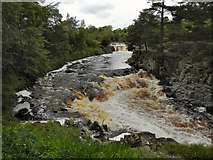 Harthope Linn, Hareshaw Linn, both in Northumberland. 'Har' is interesting here, it comes from Old English Har "gray bearded, venerable", which has come down to us as 'Hoary'. I suspect that the spray around the waterfalls was seen poetically as a grandfather's beard. But what of Welsh, that other celtic language spoken in these isles? The Welsh language has several words for waterfall: ‘rhaeadr’; ‘sgwd’; ‘pistyll’. ‘Sgwd’ (plural ‘sgydau’) occurs only in Brecknockshire, and 'pistyll' is normally only used in mid-Wales. Pistyll Rhaeadr is another of these "waterfall waterfall" names. Updated 2015-06-26 with corrections and additions from user "Karl and Ali". Added Linn and Snout. From more reading added 'Easan' too.